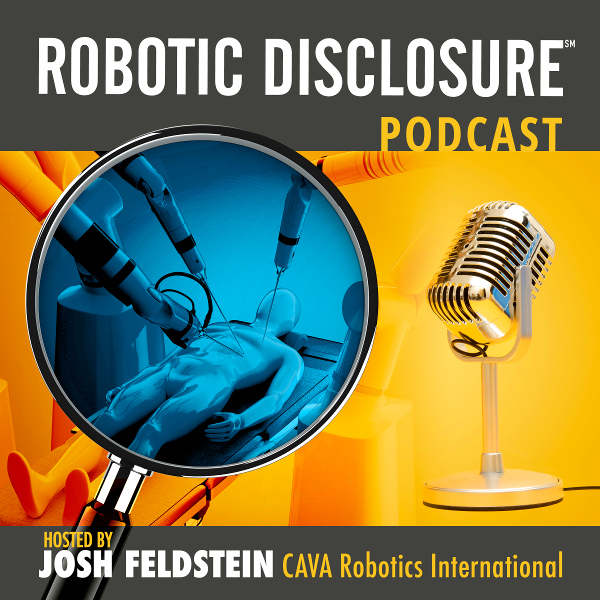 Robotic Disclosure takes the field of surgical robotics and exposes listeners to every facet of this exploding sector, including surgery, technology, and program management. Hosted by Josh Feldstein, CEO CAVA Robotics International. Visit www.cava-robotics.com to learn more. Nationally known robotic surgery expert Dr. Herb Coussons explores the keys to achieving the Triple Aim in robotic surgery, and discusses the critical elements needed to achieve a best practice robotic program. Tom Lubotsky, former Chief Supply Chain officer at Advocate Health Care (now Advocate Aurora Health), one of the largest ACOs in the US. May 8: Dr. Russ Martin, Robotic General Surgeon and cost-effectiveness specialist; Surgical Director at St. Agnes Medical Center, Fresno, CA. May 22: Jeff Punshon, Robotic Coordinator and Surgical Assistant specializing in robotics. June 5: Dr. Rick Feins, cardiothoracic surgeon and leader in simulation-based training for surgeons.